Dragon Ball Super: Episode 14 "This is All the Power I've Got! A Settlement Between Gods" Review – AiPT! At last we come to the end of the Battle of Gods arc, but who will come out on top? Beerus vowed to destroy the Earth if he won but Goku surely can’t beat a god; can he? 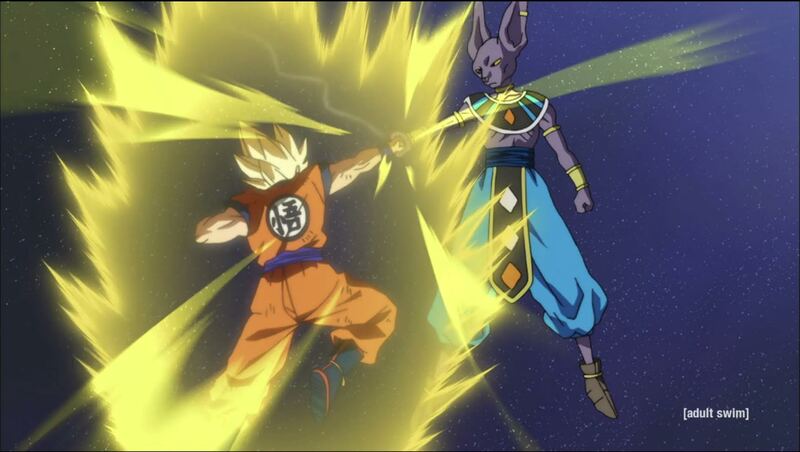 Despite no longer being a god, Goku is still able to hold his own against Beerus due to his absorption of the godly powers into his body and adapting them for himself. As the battle continues, Beerus gets the upper hand and beats down Goku under the ocean. Without oxygen Goku is losing air until Beerus drags him above the water to continue the beat down. Eventually though, Goku flames out against Beerus, using the last remaining amount of power that Goku possessed. The amount of power that Beerus had to call on to defeat Goku astonished even himself; Beerus admits that he regretted getting obsessed over finding the Super Saiyan God, if only for an instant. So Beerus ends the fight as it began, with a flick to the forehead. Feeling the regret of defeat as he falls down to Earth, Goku summons more energy and comes back at Beerus. Goku attacks with one last massive Kamehameha blast, which is countered by a Beerus atom ball blast (I’m trademarking that name). The result of the collision is an energy ball reminiscent of the Eye of Sauron or the Fiery Donut of Hell. Beerus flicks the Fiery Donut of Hell towards Goku (and coincidentally Earth) putting Goku in a precarious position. Goku converts back to a regular Saiyan while in the process of holding the Fiery Donut of Hell and punches it into oblivion. This last effort finally wipes out the remainder of Goku’s strength and he falls down to Earth, again. Luckily Vegeta is there is lend a helping hand and catch him. Yay frenemies! As Beerus comes down, Piccolo stands up to Beerus. He tries to amass the troops for a battle (although nobody really appears to be moving), just as Mr. Satan’s phone rings. On the other end is a reporter stating that a helicopter is on the way, which just shows up trying to get the “scoop” on the fight. Meanwhile Whis and Beerus discuss what is to be done now. Beerus states he can’t spare the Earth because “a Destroyer must keep his word after all.” So Beerus winds up, Vegeta makes a stand, and Goku make a plea. All to no avail. Beerus winds up and … misses?!?!? His energy blast shoots off into space as Beerus falls asleep. Whis explains this away as Beerus had used up his energy during the fight. Whis mentions that when Beerus wakes up, he will likely not remember his plan to destroy the Earth, however some “pudding” mumbling by Beerus indicates he will remember that at least. Whis also thanks Goku, and promises to return the favor someday. As they fly away, Whis and Beerus converse and indicate that Beerus just faked falling asleep and that he also never actually used 100% of his power. We end the story arc with Goku housing as much food as he can get his hands on. Goku reminds Vegeta that he was to be next in line for the Super Saiyan God power, but Vegeta shunned the idea. His thinking was that even with it, he would only become the second strongest being in the Universe (second to Beerus). So instead, he’ll improve the old fashion way, by working out. We also discover that Goku had arrived on Earth much earlier than previously thought. He was watching the Z Gang’s interactions with Beerus, while trying to come up with a strategy to defeat him. Although, he never actually came up with anything. And in the final shot, we get one last brief glimpse of the Pilaf gang as they row away. The end of the episode also left us with a new closing credits song. This time it doesn’t feel like it was cut randomly in the middle of the song to fit the allotted time slot. The previous end credits song was much longer in the original Japanese release and the Funimation dubbed version cuts the song abruptly in the middle. It’s not my favorite of the closing songs, but at least this one is short enough to fit into their schedule block. The end of the movie is rather interesting in that they give a lot more away for what is going to be coming up in the TV series than they did in the show itself. A chat between Goku and Beerus revealed that Whis is Beerus’s teacher and there are a total of 12 universes. After the next saga, the Resurrection F saga, the 12 universes thing will definitely come into play. As Goku falls back to Earth, instead of being caught by Vegeta here, Beerus actually catches him and slowly lowers him down. The end was also different where Beerus carried out his promise to destroy the Earth. Instead of falling asleep, Beerus just ended up blowing up a pile of rocks using a lame excuse that he used all of his strength in the fight. Beerus also actually apologized to Bulma for hitting her. I would have liked something like that in the series, personally, as I felt it a humbling aspect for Beerus. There are also a couple of closing end scenes. In the first closing scene, Beerus and Whis have returned to their home planet, where we find out that Beerus used almost 70% of his power in the fight. Whis and Beerus then proceed to chow down on their sushi from the party. Beerus decided to partake in a hunk of wasabi, immediately gets overwhelmed, and starts bouncing around destroying random planets. To stop the carnage, Whis knocks him out easily with a neck chop. I liked this because it indicated that indeed, Whis is by far the stronger fighter. The final closing scene is a replay of the conversation at the end of the TV series episode where Goku admits that he showed up early. In the movie however, Vegeta claims he actually wants the Super Saiyan God power, a distinct difference from the show. Considering my feelings for how the battle had been dragged out over the course of the last few episodes, you would think I would be more than ecstatic for the final episode of this arc, and you’d be right. However, I also actually really enjoyed this episode and felt it was good closure to an overly long arc. My favorite part had to be when Vegeta caught Goku after falling from the battle. This makes me just love Vegeta even more since he can not only be a callous badass, but also a rather caring individual. The battle sequences here were also not too bad. Yes, I felt like they were a rehash of things that had come before, and before, and before that, but they were done quicker here. This just goes to show you that if they had cut out most of the last two or more episodes, I think they still could have had a strong series. And on top of all of that, they still had some good conversational moments. This is really what put it over the top for me; the heart in it. This battle is an interesting one to start Dragon Ball Super off with, since most, if not all, of the previous battles in Dragon Ball and Dragon Ball Z ended with Goku defeating the bad guys. However this one seemed impossible from the start. How do you defeat a god? Well, you can’t was the result. You have to placate him and hope he gets on your side in the process. An outcome that Goku has actually rather perfected prior to this, becoming chummy with not only King Kai, but the Supreme Kais of the universe as well. One big question remains: Would I recommend the movie, Dragon Ball Z: Battle of Gods or the Super TV series arc? Personally, I think I would have to go with the movie. As with many of the movies for Dragon Ball Z, the action scenes are clean cut with not too much filler. On top of that, you also get a nice resolution within the approximately two hour runtime of a movie. Whereas in the TV series you have to wait weeks (14 weeks in this instance) to get to the conclusion. The movie here also had a much higher animation budget (clearly) with scenes that were easily better looking than anything in the TV series. Add to that my favorite part of the movie, the talk about earning your power versus taking it from other people, which was noticeably absent from the TV series. Lord knows they had enough time to fill, that they could easily have fit it in somewhere. The benefits for the TV series is that now it fits within the Super universe. Yes, nothing major was changed from the movie to the TV series, but enough was changed so that if you only watched the movie you may not understand things as they came up in future episodes of the show. So in the long run, I guess it would do the viewer good to watch that as well. I still vote for the movie though as a better and more worthwhile story to watch. So, did you like Episode 14 of Dragon Ball Super as much as I did? Share your thoughts below!